I seldom write about myself. That's on purpose. Sure, I am pretty social and outgoing but I'm actually a pretty private person too. I don't like to overshare, I like my space and I really relish my own alone time. I've been like that since I was a kid. (By the way, I have a kid who is the same way and her name is Peyton). Anyway, after my last post about love and loss, I've been thinking a lot about my birthday on Friday. I'll be 45. God willing, I've probably lived about half of my life already. And maybe I could pass for 5 or even 10 years younger than how old I really am (say some) but somehow this year leading up to 45, I've made some pretty significant changes in my life. My 20s were so much fun. Living in the city and hanging out with my friends. Getting my career off the ground. My 30s were all about getting married, buying houses, having babies and climbing the corporate ladder. 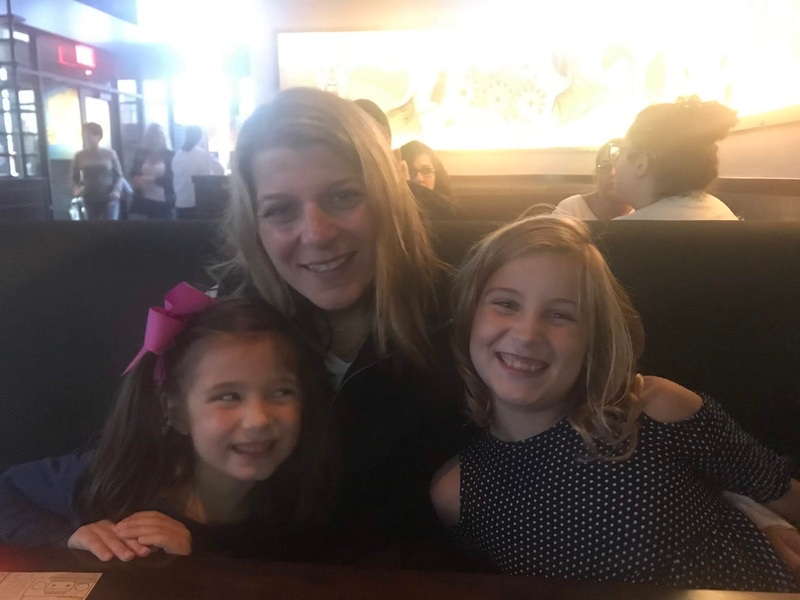 By 40, I was ready to make some big changes in my life including staying home and throwing myself into volunteering - whether through school, by coaching or managing a sports team or for a philanthropic organization in my community. This year, I think unconsciously at first, I decided to make some further changes to things in my life that impacted me directly. So starting in April, I hired a nutritionist to change the way that I ate. We don't count calories, we count macros which is protein, fat and carbs. This isn't a diet. This is developing a healthier eating lifestyle. It doesn't mean I'm never going to have a beer or a glass of wine or a piece of cake. I just know now how to work that in. And, for the first time in a very long time, like maybe before college, I weigh less than what's on my drivers license which I changed and still lied about at age 30. Ha! The second thing I embarked on this year was Invisalign. I started to feel more and more self conscious about my teeth. My front teeth had separated years after having braces and because I never wanted to have to go through braces again I had my front teeth bonded together so you wouldn't notice the gap. Of course, 20 plus years later, the bonding started to deteriorate and I started to have nightmares (literally) about the baby tooth that I still have and never fell out, finally doing so on a really important day. It was time to get it all taken care of and stop avoiding the inevitable. So in July, I started my Invisalign treatment which will be followed by an implant replacing my baby tooth (that's still hanging in there - no pun intended - after 44 plus years!). The last thing I did happened just last week. I've worn glasses since 6th grade and contacts since 9th. Both my brothers have had Lasik eye surgery and wondered why I never did. It just wasn't important to me then. But this year I had been thinking about it more and more. Again, something was pushing me to just do it. So I went for my consultation on Tuesday and on Wednesday I had the surgery. It's been a week and it feels so odd after 30 plus years not to reach for my contact case in the morning. Okay, truth is I have reached for it once. But so far I'm impressed with the results (recovery time is still one month as your vision keeps improving every day). But it was easy, virtually painless and life changing. Why did I wait so long?! Today marks the third anniversary of Adler's death. Three years went by in what seemed like the blink of an eye. My kids are three years older and I now have a 2.5 year old new dog. As I reflect back on that time after losing her, my grief was so real and so raw. It felt suffocating at times like I wasn't ever going to be able to remember her without crying. Yes, I know she was a dog but she wasn't just a dog. She was a member of my family. Time did heal and getting Sadie certainly helped too. But, it really took me almost three months to feel like I could breathe without her. To this day, I still think of her almost daily and miss her. And, yes, she was "just" a dog. I can't even imagine if it was one of my own "human" children. 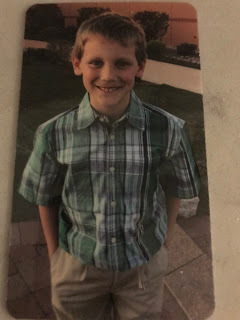 Unfortunately, one of my very best friends lost her 8.5 year old child unexpectedly last week. Thinking about the pain I felt for Adler who was a dog and an old dog at that can't even come close to what she is feeling and going through. I know her son, Maddox, will be close in her thoughts every day for the rest of her life. She will miss him every day for the rest of her life. She will never be the same again for the rest of her life. This will change her. This will change her family of six - now her family of five. This will change us. Her friends. We've never had a best friend who has lost a child before. How do we take away her pain? How do we support her? How do we help her grieve? How do we not forget her child and keep his memory alive not just next week or next year but when 5 years or 10 or 20 years have passed? These are all questions we're going to do our best to find the answers to so we can be the best support system we can for her. Because there's few people in your life who mean as much to you as your family and she's one of them. 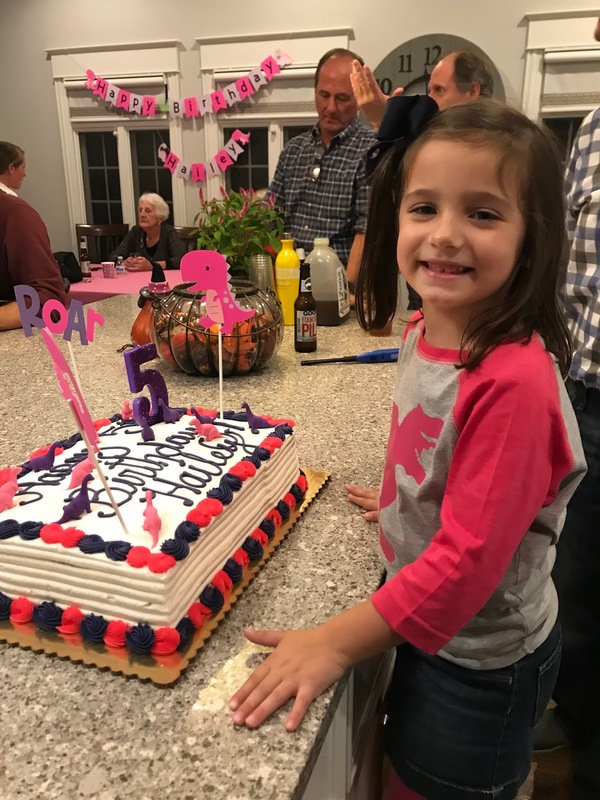 Happy 5th Birthday to Hailey! It’s hard to believe my baby turned 5 just last week. We celebrated her for almost a week. 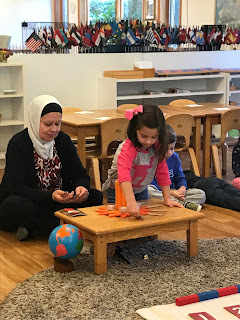 First, with a family Birthday Party and then we had a little celebration at school for her class. This Birthday was all about dinosaurs. “No one is going to buy me dolls, mom,” she tells me. 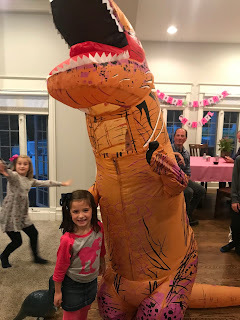 “They all know I like dinosaurs!” So from her invitation to her cake to the surprise walking T-Rex (aka Austen) we went full on dinosaur. Heck, even her party T-shirt had a Dino on the front and a number 5 on the back. And, not surprisingly many of the presents she opened were none other than dinosaurs. 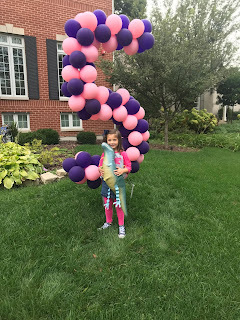 At school, she got to walk around the sun five times to signify that she was five years old, sharing one picture for every year of her life. She called on 5 friends to wish her some birthday fun and I was surprised she called on 3 girls. 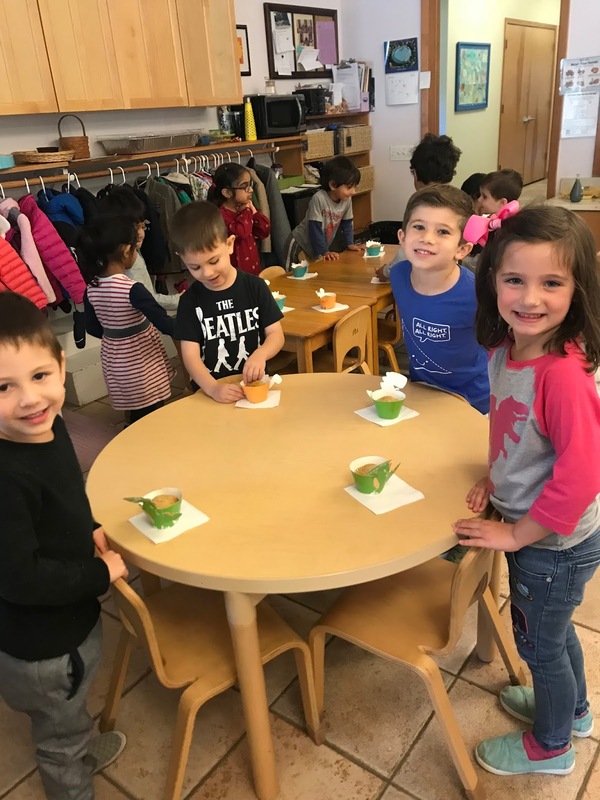 However, when it was time to choose 3 friends to sit with to eat her special birthday treat, she chose all boys. 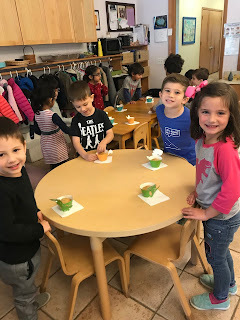 Speaking of the birthday treat, Hailey chose none other than Dino muffins (banana bread muffins but dressed like dinosaurs). I think they were a roaring hit! Notice all the dinosaurs on her birthday cake! A T-Rex came to my party! 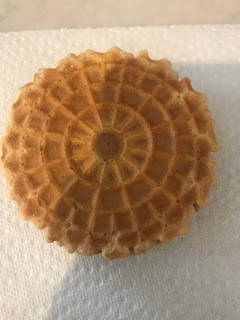 The Pizzelle - defined as an Italian waffle cookie has special meaning for me. I remember as a little girl watching my Italian grandmother make these deliciously, light cookies in what looked like a double waffle maker. She would stack them up on the dessert tray after dinner and I probably would eat too many of them. I especially loved eating them as a sandwich with peanut butter and jelly in between. So imagine my surprise when I started seeing a nutritionist (because I wanted to revamp how I ate and how my family ate) and she told me that these cookies are the perfect, low carb sweet treat. I found an old love made into my new favorite dessert - of course I can't pair them with the regular peanut butter and jelly but I can get pretty close with some PB2 (powdered peanut butter packed with protein and little fat) and light/low sugar jelly. However, my kids have really enjoyed eating pizzelles with PB&J (as kids they need the fat more than I do) as a snack after they come home from school. And, I'm enjoying remembering my grandmother and how many memories that pizzelle brings back.